NASHVILLE — Montreal lightweight John (The Bull) Makdessi won a unanimous decision over Peruvian Jesus (El Mudo) Penudo on a UFC televised card Saturday. The fight was short on action with the taller Penudo offering little. The judges scored it 30-27, 30-27 and 29-28 for Makdessi (17-6-0), who stretched his UFC win streak to three. "He tried to play my game and be the counter-fighter and he had good boxing, I felt his shots," said Makdessi. "I respect him, it was a boring fight, but he's good. I had to be the one to take the risk and engage because he kept staying far." It was the 16th UFC fight for Makdessi, who has won 10 and lost six. Among Canadians, only Georges St-Pierre (22), Patrick (The Predator) Cote (21) and Sam (Hands of Stone) Stout (20) have more UFC fights to their credit, and all three are retired. After a slow first round that drew the ire of the 10,863 at Bridgestone Arena, Makdessi's kicks began to take their toll on Penudo's lead leg. The second round was also uneventful until the final seconds when the two fighters started exchanging blows. Referee Herb Dean warned Penudo to engage in the third round that was equally drab. The 22-year-old Penudo (16-5-1) came in riding a seven-fight win streak including his UFC debut last time out. The two were paired last week after their original opponents withdrew through injury. 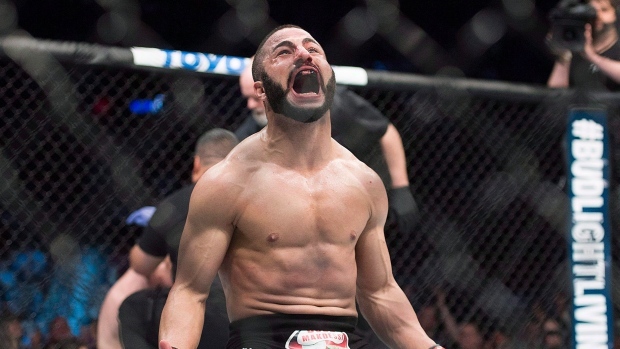 "I'm going to go back to the drawing board and talk to my team," the Halifax-born Makdessi said. "I've been in the game for over eight years now and I want to prove myself. I want to ask (UFC president) Dana White for an opportunity to fight a top-15 guy with a good training camp behind me. I want someone who is going to try and engage with me in a standup war." In the main event, former lightweight champion Anthony (Showtime) Pettis knocked out welterweight contender Stephen (Wonderboy) Thompson at 4:55 of the second round. Thompson (14-4-1) is ranked No. 3 among 170-pound contenders while Pettis (22-8-0), moving up a weight class, is the No. 8 contender among 155-pounders. A longtime member of Montreal's Tristar Gym, the 33-year-old Makdessi now trains in Milwaukee under coach Duke Roufus, a four-time kickboxing world champion. There were two other Canadians on the Nashville card. Alexis Davis, a native of Port Colborne, Ont. who now fights out of California, lost a unanimous decision (29-28, 29-28, 29-28) to Brazil's Jennifer Maia. Davis (19-9-0) came into the bout ranked fifth among flyweight contenders while Maia (16-5-1) was No. 11. Strawweight Randa (Quiet Storm) Markos of Windsor, Ont., submitted American Angela (Overkill) Hill via armbar at 4:24 of the first round. "I felt great in there," said Markos. "I've been seeing a sports psychologist and we've really been focusing on getting me to relax and not be as nervous and waste all this energy before I even get to the fight. It's about going back to who I used to be before the pressure of the UFC and I think that had a big impact on this fight." Markos (9-7-1) is ranked 15th among 115-pound contenders. "I'm always looking to fight people above me and climb that ladder, so I'm up to fight anyone who will take it and get me closer to that belt," Markos, who improved her UFC record to 5-5-1, said of her next opponent. "Someone in the top 10 would be amazing. The unranked Hill dropped to 8-6-0.